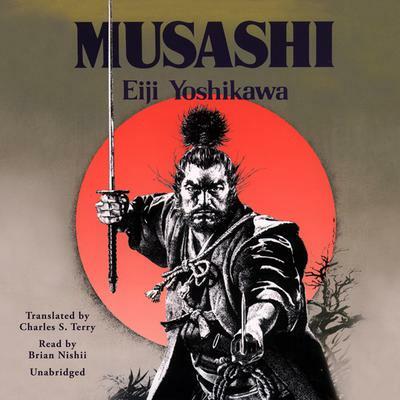 The classic samurai novel about the real exploits of the most famous swordsman Miyamoto Musashi was the child of an era when Japan was emerging from decades of civil strife. Lured to the great Battle of Sekigahara in 1600 by the hope of becoming a samurai—without really knowing what it meant—he regains consciousness after the battle to find himself lying defeated, dazed, and wounded among thousands of the dead and dying. On his way home, he commits a rash act, becomes a fugitive, and brings life in his own village to a standstill—until he is captured by a weaponless Zen monk. The lovely Otsū, seeing in Musashi her ideal of manliness, frees him from his tortuous punishment, but he is recaptured and imprisoned. During three years of solitary confinement, he delves into the classics of Japan and China. When he is set free again, he rejects the position of samurai and for the next several years pursues his goal relentlessly, looking neither to left nor to right. Ever so slowly it dawns on him that following the Way of the Sword is not simply a matter of finding a target for his brute strength. Continually striving to perfect his technique, which leads him to a unique style of fighting with two swords simultaneously, he travels far and wide, challenging fighters of many disciplines, taking nature to be his ultimate and severest teacher and undergoing the rigorous training of those who follow the Way. He is supremely successful in his encounters, but in the Art of War he perceives the way of peaceful and prosperous governance and disciplines himself to be a real human being. He becomes a reluctant hero to a host of people whose lives he has touched and been touched by. And, inevitably, he has to pit his skill against the naked blade of his greatest rival. Musashi is a novel in the best tradition of Japanese storytelling. It is a living story, subtle and imaginative, teeming with memorable characters, many of them historical. Interweaving themes of unrequited love, misguided revenge, filial piety, and absolute dedication to the Way of the Samurai, it depicts vividly a world Westerners know only vaguely. Full of gusto and humor, it has an epic quality and universal appeal. Miyamoto Musashi was the child of an era when Japan was emerging from decades of civil strife. Lured to the great Battle of Sekigahara in 1600 by the hope of becoming a samurai—without really knowing what it meant—he regains consciousness after the battle to find himself lying defeated, dazed, and wounded among thousands of the dead and dying. On his way home, he commits a rash act, becomes a fugitive, and brings life in his own village to a standstill—until he is captured by a weaponless Zen monk. The lovely Otsū, seeing in Musashi her ideal of manliness, frees him from his tortuous punishment, but he is recaptured and imprisoned. During three years of solitary confinement, he delves into the classics of Japan and China. When he is set free again, he rejects the position of samurai and for the next several years pursues his goal relentlessly, looking neither to left nor to right. Ever so slowly it dawns on him that following the Way of the Sword is not simply a matter of finding a target for his brute strength. Continually striving to perfect his technique, which leads him to a unique style of fighting with two swords simultaneously, he travels far and wide, challenging fighters of many disciplines, taking nature to be his ultimate and severest teacher and undergoing the rigorous training of those who follow the Way. He is supremely successful in his encounters, but in the Art of War he perceives the way of peaceful and prosperous governance and disciplines himself to be a real human being. Musashi is a novel in the best tradition of Japanese storytelling. It is a living story, subtle and imaginative, teeming with memorable characters, many of them historical. Interweaving themes of unrequited love, misguided revenge, filial piety, and absolute dedication to the Way of the Samurai, it depicts vividly a world Westerners know only vaguely. Full of gusto and humor, it has an epic quality and universal appeal. Each morning and evening I was looking forward to my trip from and to the office. Why? I knew great speaker Brian Nishii would accompany me on the trip reading Yoshikawas Musashi. Eiji Yoshikawa (1892–1962) was considered one of the best historical novelists in Japan. Among his best-known novels, most are revisions of older classics. He was mainly influenced by classics such as The Tale of the Heike, Tale of Genji, Outlaws of the Marsh, and Romance of the Three Kingdoms, many of which he retold in his own style. He was awarded the Cultural Order of Merit in 1960, the Order of the Sacred Treasure, and the Mainichi Art Award.